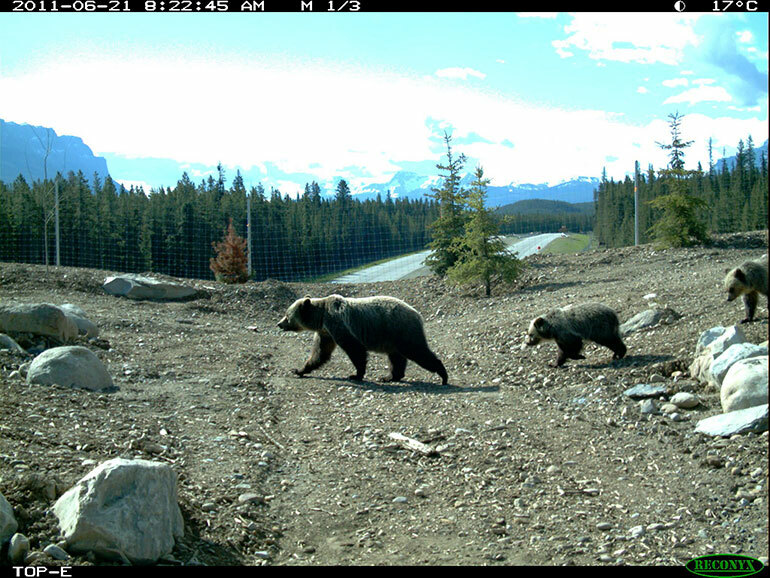 A screenshot from Banff’s Temple overpass shows a female grizzly escorting her cubs across the Trans-Canada Highway. Researchers have determined how female grizzly bears keep their cubs safe while crossing the Trans-Canada Highway. Adam Ford, Canada Research Chair in Wildlife Restoration Ecology at UBC’s Okanagan campus, along with Montana State University’s Tony Clevenger, studied the travel patterns of grizzlies in Banff National Park between 1997 and 2014. In most cases, a mother bear travelling with cubs opted to use a wildlife overpass instead of a tunnel to cross the highway. During the 17-year study period, bears not travelling in these family groups used both underpasses and overpasses. The study looked at five different wildlife crossing structure designs distributed across 44 sites along a 100-km stretch of the Trans-Canada Highway. The structures are purpose-built bridges or tunnels to facilitate the safe movement of animals across roads. Tracking and motion-triggered cameras were used to monitor grizzly bear movement and Ford says all grizzly bears selected larger and more open structures like overpasses and open-span bridges, compared to tunnels and box culverts. “Since adult females and cubs drive population growth, this research tells us that overpasses are needed to protect bears in roaded areas,” says Ford. The study also documents the most cost-effective means to design highway mitigation. A common concern in conservation is how to allocate funding to bring the most effective gains for biodiversity. The researchers estimated the cost-effectiveness of structure designs and were surprised by the result. “When we look at the population as a whole, there were a lot of passages made by males in box culverts, which is the cheapest type of structure to build,” explains Clevenger, stressing that a diversity of wildlife crossing structure designs along a highway is essential. This peer-reviewed study was published online this week in the Wildlife Society Bulletin.